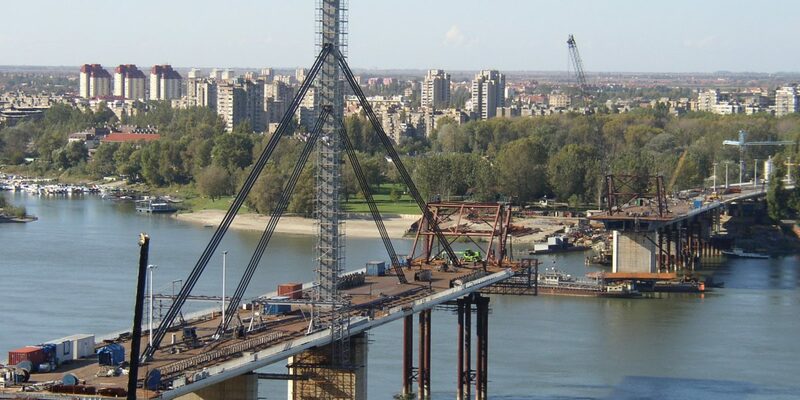 The original structure of Sloboda Bridge constructed between 1976 and 1981 was destroyed in NATO bombing in 1999. The original structure, reconstructed between 2002 and 2004, is 1312m long with 22 spans, but actually consists of four separate bridges. 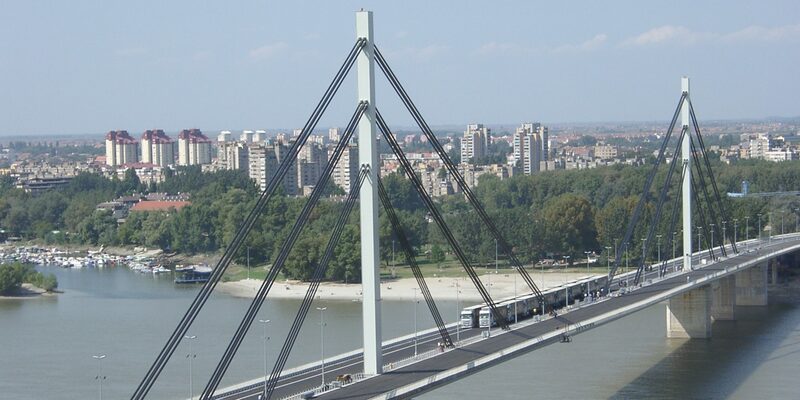 The first ten 30.1m spans starting from the left bank (City) consists of two parallel and mirrored bridges constructed in prestressed concrete fixed to each support. Then there are four 60m spans simply supported and constructed as composite sections with a steel lower tension flange and concrete upper flange that form the road way. Three similar spans form the last three sections of the structure on the right bank. 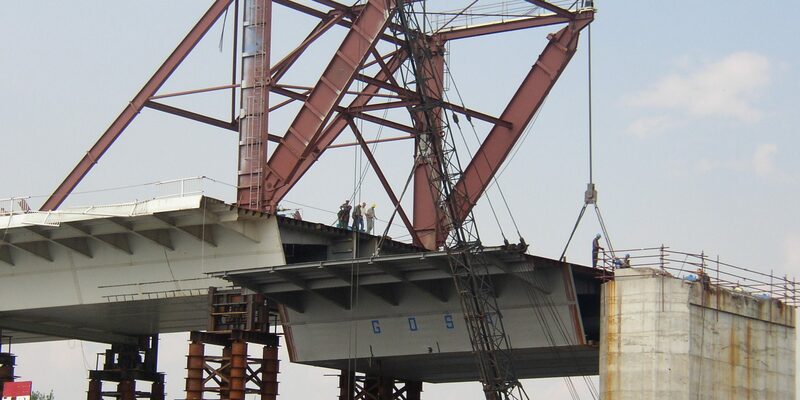 In between there is a cable stay steel structure, consisting of two approach spans of 60m each side and a main central span of 351m (60+60+351+60+60m). The German company DSD Dillinger Stahlbau GmbH won the E.A.R.’s international tender as general contractor for the reconstruction project (€43 million) and the supervision contract (€2 million) was awarded to louis Berger S.A. of France. The overall project was managed by the European Agency for Reconstruction and financed by the European Union. 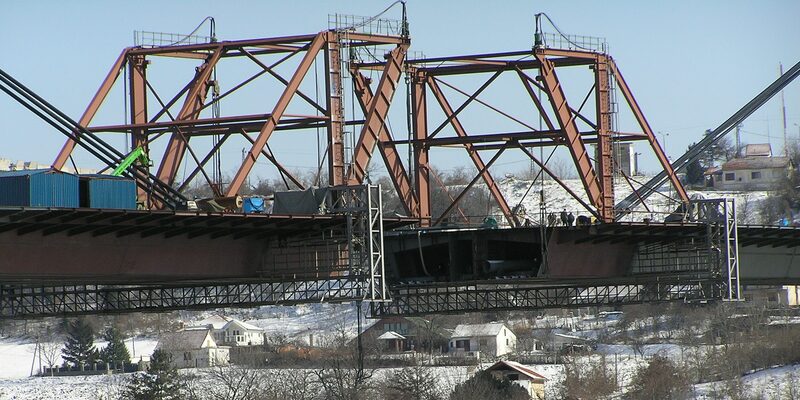 Certain parts of the bridge structure, damaged by the struck of two missiles, had to be removed before commencement of real reconstruction. An early part of the reconstruction project therefore included removing the remaining of stay cables, dismantling of heavily damaged pylon and relocating the structure into its original position. The main part of the original structure was moved back towards the right bank with the damaged cables still attached. After the structure had been removed to its correct position, the loose cables an te main long cables from the pilon were removed. As the missile hit ylon at its base, the whole main pilon underneath had to be replaced entirely. Also, one of the piers had to be rebuilt while another one that were inclined was “brought” back to the vertical. 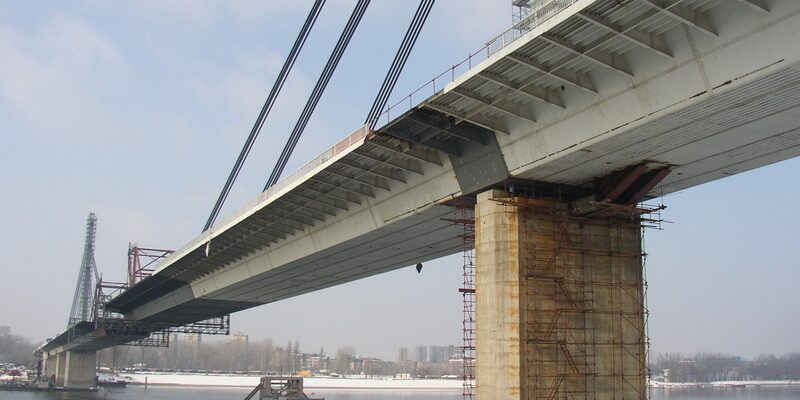 New segments for the pylons and bridge deck were manufactured in three factories: GOSA in Smederevska Palanka (Serbia), MIN in Nis (Serbia) and Facom in Skopje (Macedonia). After the segments were cut and formed in the large purpose-built workshops, each section was delivered to an assembly point at Brnjica near Golubac in Serbia. 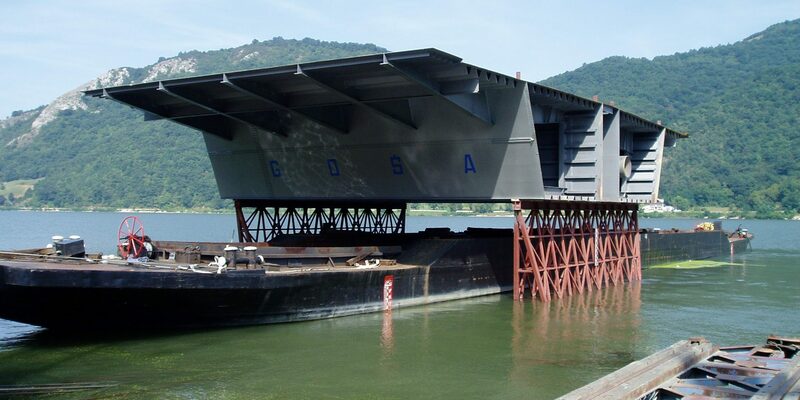 In a shipyard on the river Danube, all the prefabricated segments for the bridge were then assembled in main sections weighing between 120 and 180 tons, before being loaded on to a barge and shipped to Novi Sad which is some 222km upstream. 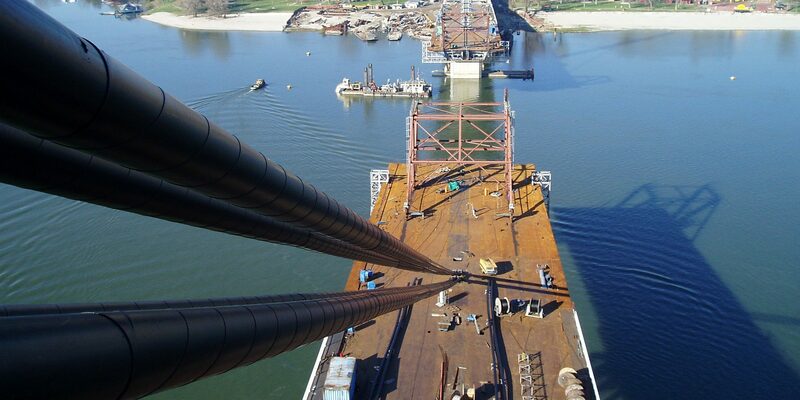 Each segment delivered by barge to Novi Sad site was first lifted to the underside of the previous segment for weld preparations and final adjustments to be made. Lifting of segments were performed by means of derrick crane. Before the final welds can take place to the sides of the bridge have to be levelled by fine tuning of the cable tensions. Each cable stay consists of four cables anchored at the top of the pylon and stressed from the deck level. Each cable consists of between 54 and 86 individual strands. Each cables was stressed individually so that the group of cables ended up evenly stressed.